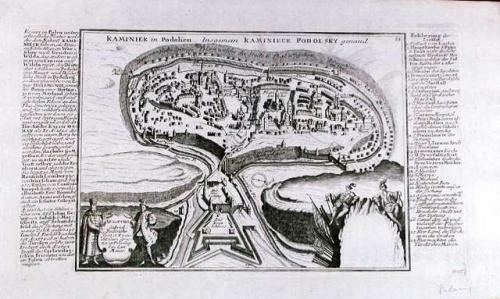 Bird's-eye view of Kaminiek in Podolien (Kamieniec Podolski, Kamyanets Podilsky). Once belonging to Lithuania now in the Ukraine the settlement originated in the 10th century. In the 16th century the fortifications were rebuilt in stone. The town was built on an island in the river and was conected to the castle by a bridge. A description and key has been engraved to both sides of the image.